This is a rare surname of French origins. 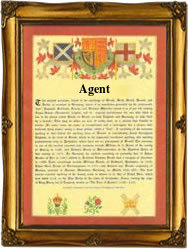 It derives from the 14th century French word 'agent' of which the nearest modern equivalent meaning is a policeman. In medieval times the word probably described a watch keeper, one who may also have doubled up as the representative of law and order on the street. At this time communal policing was not taken very seriously. The nobility and the rich when they wished to travel about, surrounded themselves with plenty of guards, who were perhaps known as smiths, from the ancient German and Old English 'smitan', meaning to smite. This is a situation which coincidentally also seems to be developing again in the late 20th century, film stars, politicians and the like, in many parts of the world feeling the need for 'body guards'. Occupational surnames in the medieval period became hereditary when a son followed his father into the same occupation. This obviously happened less often amongst the 'agents' than the 'smiths', the recordings for the former being very small in comparison. The early recordings which do survive, and most of those in France were lost during the Revolution of 1792 include: John Agent, who married Phillis Gilcreast at St Martins in the Field, Westminster, on July 22nd 1718, and William Agent and his wife Sarah, witnesses at St Luke's church, Finsbury, on November 14th 1869. In France we have the extraordinary recording of Hyacinthe Agent, who married Marguerite Chevreux on November 22nd 1808, at Bouxieres Sous Froidmont, Meurthe et Moselle, on November 22nd 1808, during the reign of Emperor Napoleon Bonaparte (1800 - 1815).